I will not discuss individual episodes here, but provide my overall thoughts and feelings about the show. All in all Star Wars Resistance can be enjoyable, but it has its shortcomings. Much was made about the starship racers in the promotional videos leading up to the pilot episode, the Aces, residing on the Colossus station. But in retrospect racing was a very minor element on the show with only two or three episodes maybe revolving around that. So anyone who expected high octance racing was probably somewhat let down. Instead the show is centered around Kaz, the undercover Resistance agent who is supposed to find a First Order agent on the Colossus. And he is not a racer, despite being a talented pilot, he poses as a mechanic, with the signature starship of the show mostly spending time in the hangar, undergoing repairs or maintenance. To me, it was somewhat of a surprise that despite a rather large cast of characters, Kaz is the focus and center of the show in every episode. The supporting cast is just that, support for the main character. Now some of the supporting characters are fleshed out more than others, but all of their stories always connect them with Kaz. So you absolutely have to like Kaz, or else the show might not be something for you. Overall, Kaz is fun, but the emphasis on slapstick and Kaz’s clumsiness might be something somewhat older viewers (anyone who is not a very young child) may find off-putting after a short while. In a way Kaz’s antics might remind you of Jar Jar Binks. But at least you can say to yourself that Kaz’s clumsiness is also part of his disguise. Because as soon as Kaz is in a cockpit or on a mission with Poe Dameron, he’s shown to be much less clumsy and more competent. The story told in season 1 is not too original. The central premise is that the First Order wants to gain a foothold on the Colossus and in order to achieve that they hire some pirates that attack the station every now and then – so that the First Order can offer their assistance in fighting the pirate raids. This is something I remember seeing in the Buck Rogers movie/show when I was a kid almost 40 years ago. But even if you don’t know about that the overall plot was pretty transparent. Another trope the show used was the bad girl with a heart of gold in the form of the pirate girl Synara, who turned out to be not evil at all and in the end helped save the day in the season finale with her band of pirates. You knew that was going to happen the second she was “saved” by Kaz and Poe while on a mission in space. One thing I heavily disliked was the handling of the character Tam, who is on “Team Fireball” and friends with Kaz and Neeku. It is obvious the writers wanted to create some drama and tension and made her defect to the First Order at the end of the season, because she felt betrayed that no one had told her about Kaz spying for the Resistance. It sounds silly, it is silly. And then there is the final confrontation between her and her former friends, who beg her not to go with the First Order, who are about to evacuate the station. But no one bothers to tell her that the First Order just killed billions of people by blowing up Hosnian Prime (we do get to see an animated version of Hux’ speech on Starkiller Base and we also see the destruction of Hosnian Prime in a holovid broadcast to the First Order troopers on the Colossus). Why anyone would fail to mention this fact is beyond me. Surely the writers knew that if Tam learns about this fact, that she could not go with the First Order, only a psychopath would willingly join an organisation that just killed billions of innocent people. So they conveniently wrote the scene in such a way that Tam apparently never learns about the destruction of the Republic and her friends never tell her about it, even though they beg her to stay with them. It makes zero sense and was very bad writing. All in all Star Wars Resistance is not too original when it comes to the stories it tells. You may argue it’s a show for kids, so stories need to be somewhat simpler perhaps, but maybe the overarching plot could have been somewhat more innovative. And I am not so sure about kids not being able to handle somewhat more complex stories. Resistance suffers from a few other things. While the Colossus is home to a very colorful cast of characters and various aliens, there is not that much to do on a stationary platform anchored in some vast empty ocean. So while the episodes set on the Colossus usually provided enough fun to be entertained by them, the episodes were often quite inconsequential. The show picked up the pace each time Poe Dameron appeared and when he and Kaz went on a mission off station in outer space. But that happened only a couple of times. I suppose the showrunners themselves quickly realized that having a show set on a platform on some remote planet is not ideal. So at the end of the season we find out the Colossus is not at all a stationary platform, but indeed a spaceship equipped with a hyperdrive and in the final episode the Colossus makes its escape to some unknown destination (because Neeku was too silly to enter all the coordinates to D’Qar, of course). Now that the Colossus is mobile and in space the showrunners have much more story potential, since the Colossus could, in theory, encounter new planets or situations each week. This is not too unlike what Star Trek Deep Space 9 found out during its run: the showrunners realized back then that a show set on a space station can be very limiting, so they gave the crew a spaceship in later seasons. With the show set shortly before The Force Awakens one might have expected some more background on the First Order or the Republic. Surprisingly, virtually none was provided. The First Order is as mysterious as ever, we learn more or less nothing new about them and the Republic gets mentioned every now and then, but we learn virtually nothing about it either. Now Kaz and Poe do find out about First Order weapons tests and we find out a bit more about the development of Starkiller Base, but it’s only some breadcrumbs. I suppose the show couldn’t reveal anything too major about the First Order. Now all of that may sound quite critical and overall I would say Star Wars Resistance is just an average show. When we talk about plot and characters Resistance is – in my opinion – the weakest of the animated shows (discounting the droids show), The Clone Wars and Rebels both had much stronger stories and characters. Resistance’s animation style however, works. The anime style may be something new after the CGI look of Clone Wars and Rebels (Resistance is also CGI, of course, but has a different aesthetics), but the show looks like Star Wars, used universe and all, and it most certainly looks better than Rebels. Rebels, many times, looked cheap, very sparse, quite stylized, Resistance looks much more organic here, more lived in, more alive. And some of the camera work on the show is great, especially during the few (and very short) dogfights or races. Also, even though many of the episodes were not really important, when we talk about overall plot, all in all I never felt bored. The generally lighthearted tone of the show and the short 21 minute runtime makes it easy to watch the episodes and to feel entertained. But all of that hinges on one thing: whether or not you can stand the antics of Kaz and his friend Neeku, both of whom can be either quite silly, clumsy or, in the case of Neeku, borderline idiotic. So you either find them funny or annoying. 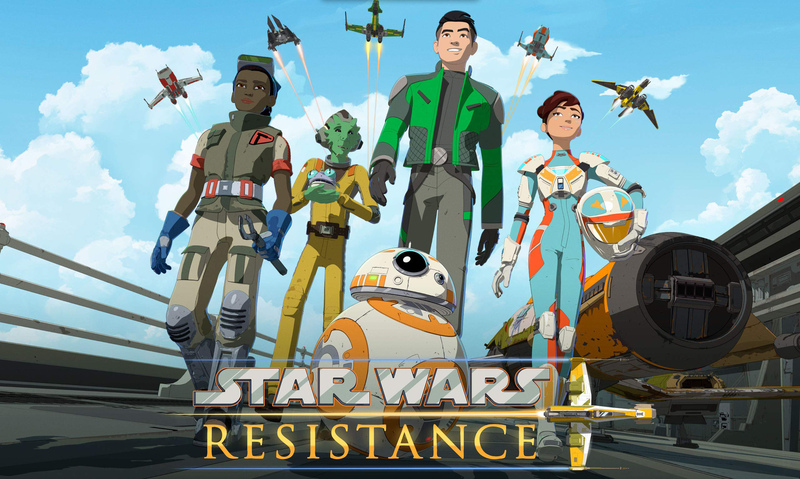 To sum it up, Resistance is mostly fun, easy to watch, provided you like some of the sillyness, but compared to the previous two animated shows the least essential show. It adds nothing to the overall Star Wars lore and you missed out on absolutely nothing if you never watched Resistance. It doesn’t provide any deeper understanding to the sequel trilogy timeline or to The Force Awakens. We learn virtually nothing new about anything. Also, I feel the marketing for the show was somewhat misleading, since racing barely mattered at all on the show and it seems this element is completely gone now with the Colossus in space and on the run from the First Order. Season 2 was greenlit a while ago and it will be interesting to see if Resistance will have a more intriguing plot next season. The show will most certainly be set in the Last Jedi timeline, and provided how little time passed in the movie, season 2 has to give us a first glimpse into events leading up to Episode IX. Season 2 will air in fall 2019, before Episode IX hits theaters in December. Finally, ratings for the show are bad. As in really bad. The live and same day streaming numbers are about 300-500 thousand viewers in the US. So basically, Resistance is ignored by an overwhelming majority of fans. The show is released on streaming several hours before it airs on Sunday nights, maybe a few more fans watch the show after the weekend, but even so, it’s obvious that Resistance is not a ratings hit. But as it is with animated shows a season two order was always virtually guaranteed. It remains to be seen if Resistance can ever become as important or beloved as The Clone Wars or Rebels. So far, there is no real breakout character like Ahsoka or Hera on the show. Also, the show is aimed at very young kids, which may have convinced the writers to only write very basic and simple plots, the show misses a lot of the complexity and nuances the other two animated shows provided. Also, looking at ratings, it seems that Disney’s goal to reach a meaningful number of kids has not been met at all yet again. And no one knows how many of the 300-500k viewers actually are kids, and not adults. So in the end Forces of Destiny, Galaxy of Adventures and Resistance all fail to reach the target demographic in any meaningful way. That should tell Disney something, maybe it’s time to rethink the overall approach to kid-friendly entertainment. For Resistance to become more relevant the show absolutely has to dive deeper into the lore, tell us more about the First Order, give some of the characters more depth and tone down some of the silly antics. But that is written from the view of an adult. So, what do you think about Star Wars Resistance? And if anyone watched the show with their kids, what did they think, since they are the target audience, after all. Leave your thoughts in the comments!